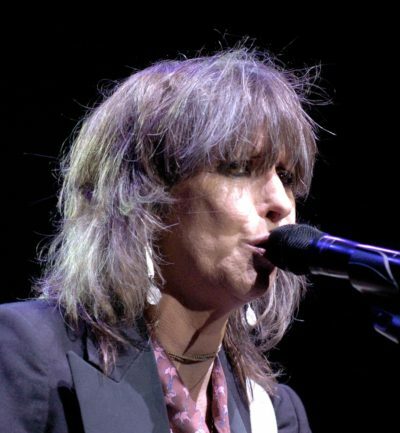 Place of Birth: Akron, Ohio, U.S.
Chrissie Hynde is an American singer, songwriter, and musician. She is the lead singer and guitarist of the rock band The Pretenders. Chrissie is the daughter of Dolores E. (Roberts) and Melville Grant “Bud” Hynde. Chrissie has a daughter with English musician Ray Davies, of The Kinks; and a daughter with her former husband, Scottish musician, singer, and songwriter Jim Kerr, of Simple Minds. Chrissie’s paternal grandfather was Leonard Grant Hynde (the son of Alexander Grant Hynde and Maria Johns). Leonard was born in Pennsylvania. Alexander was born in Nova Scotia, Canada, the son of David Hynd and Mary Ann Grant. Chrissie’s great-grandmother Maria was born in Ohio, to Welsh parents. Chrissie’s paternal grandmother was Evelyn Emza Craig (the daughter of James Thomas Craig and Alice Sonora Castello). Evelyn was born in Ohio. James was the son of Benjamin Franklin Craig and Eliza Ellen Casey. Alice was the daughter of David Andrew Castello and Emza Maria/Marie Campbell. Chrissie’s maternal grandfather was John Seth “Jack” Roberts (the son of George Roberts and Sarah Margaret Ruby). Jack was born in Ohio. Chrissie’s maternal grandmother was named Irene E. Irene was born in Ohio, to Welsh parents. where can i report that ? why you chose that ugly pic ?